Alexander Hamilton and his wife Eliza had just moved from their home on Wall Street in the heart of the city to a quiet section uptown. They’re mourning the loss of their son, Philip, who was killed in a duel. It was Hamilton who had advised him to shoot in the air and had given him the guns. They’re also mourning the loss of their happy marriage, after Alexander’s affair was made public and humiliated the entire family. Throughout the play, there is a theme of never being satisfied - of Hamilton writing and creating and striving “like he’s running out of time.” He’s always looking ahead and working on the next thing. But in the song “It’s Quiet Uptown,” they’re faced with the unimaginable things that have happened to them. Despite all of Hamilton’s accomplishments and aspirations, the grief and loss they feel are overwhelming, transformative. He begins to see that he had the elements of happiness all along. It makes me wonder: What would be enough? Can you have dreams and hopes and still be content with what you have? I think it’s possible, but that it goes against our nature. We have to work every day to be mindful of what’s right in front of us, before we become so used to it that it’s lost and we only realize it when it’s gone. Generosity is one of the five elements of working out loud. There’s an entire chapter about it in the book which describes why and how you benefit from making small contributions freely, without strings attached. This week in Japan, I was reading a very different kind of book with its own chapter on generosity, and it described some other remarkable benefits. 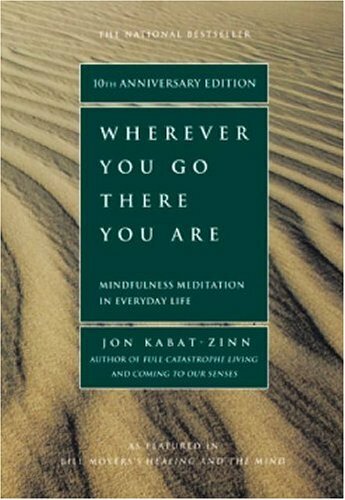 The book is Wherever You Go There You Are by Jon Kabat-Zinn, an inspiring and yet practical guide on meditation and becoming more mindful. He used the phrase “the mindful cultivation of generosity” to describe the practice of learning how and why to give, beginning with small steps. “A good place to start is with yourself. See if you can give yourself gifts…such as self-acceptance, or some time each day with no purpose. Practice feeling deserving enough to accept these gifts without obligation - to simply receive from yourself. The small gifts can be the universal ones we begin with in Working Out Loud circles. These include recognition and appreciation, showing gratitude, giving credit and positive feedback, letting people know you’re thinking of them. When offering even these seemingly simple gifts, you become more in touch with your motives for giving. As you practice offering gifts freely, you open yourself up to doing and being more, to giving more of yourself. “Give more than you think you can, trusting that you are richer than you think. Celebrate this richness, Give as if you had inexhaustible wealth. This is called ‘kingly giving.’"
He’s not speaking of money or even your time, but of something more important. While a given individual may not respond to your offering, there will tend to be a response from your network as a whole, particularly as you deepen relationships with people. They’ll be more likely to help you, for example. The mindful cultivation of generosity, though, does more than help you reach your goals. It expands your sense of who you are, what you’re capable of, and what’s possible. “Giving…helps us become more mindful of our inner wealth. By practicing mindfulness of generosity, by giving, and by observing its effects on ourselves and others, we are…discovering expanded versions of ourselves.